Turnover and lack of engagement are costing companies millions of dollars each year. More than 40 years of studies and analytics produced by The Gallup Organization confirms that those employees who are able to focus on what they do best at work tend to be more engaged and are more successful in their roles. The result was increased performance, employee satisfaction and retention. When a company embraces a strengths based culture, it can reduce employee turnover by increasing employee engagement while also affecting the success of the bottom line. 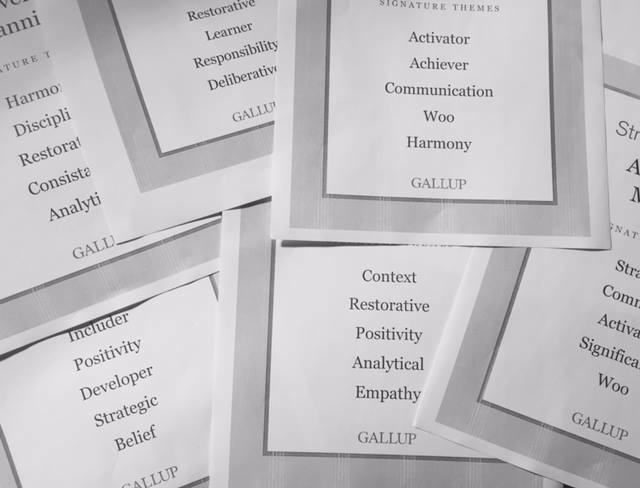 I coach people for a living as a GALLUP-Certified Strengths Coach and John Maxwell Certified Coach And in every case, I have a simple goal: to help my client, you, become the best version who you are through breakthrough. company to be. ... It is the client who determines the goals and commits to their goal, while allowing the coach to help hold them accountable. I help you see what you may not see and hear what you may not be hearing. The John Maxwell Leadership Game is only 2 hours in duration and can include up to 12 team members to participate. Landing the right job can be a daunting process. It is a full-time job just to look for a career change let alone have an understanding of successful job searching tactics and how to even begin to find your best fit. Creative ways to market yourself outside of the job boards; programs may be customized for individuals, groups, college graduates or upcoming outsourcing needs. If you are experiencing a downsize/layoff and need a resource that is knowledgeable to work with, I’m here to help. Whether you are responsible for developing your company, others or yourself, the more effective you are as a leader, the further you will go. This lab is a powerful combination of education, accountability, peer brainstorming and support in a group setting. The impact will provide valuable insight whether you are a newly appointed leader or a tenured executive. The secret to success begins with awareness and intentionality in our growth. Leader Labs are interactive, discussion oriented, and allow you to learn from others on how they have solved a leadership problem in the past. Leader Lab programs range from 3 to 10 weeks in length and meet one hour per week on site at your organization. I bring energy, authenticity, action steps and real life examples of how to take your leadership or team to the next level. Get your audience involved in discovering their passions and the true meaning of living a purpose driven life. Engage your audience, team or event! I’ve been a keynote speaker for corporations, colleges and foundations. I have also provided leadership and motivational speeches to graduates, associations, board meetings, conferences, student programs and corporate kick-off meetings. Customized programs can be developed for your organization to align with your message. The looming worldwide leadership shortage means that organizations where women lag in leadership roles are missing a huge opportunity. Introducing your women leaders to Women in Leadership allows you to build your bench strength while leveraging your women leaders unique strengths to drive strong business results. If you are a woman seeking to advance or an organization looking to offer your women leaders an avenue to further develop their leadership talents, this workshop will equip you with the mindset and skills to lead with confidence.